UNISDR facilitates mobilization and consultation within the children and youth movements globally to support their effective engagement in implementing the Sendai Framework for Disaster Risk Reduction. UNISDR works closely with children, youth and related partner agencies from all regions to help raise the voice and profile of children and youth in international and regional disaster risk reduction forums, including global and regional platforms for disaster risk reduction, to ensure that their capacity and talents are recognized when it comes to contributing effectively to disaster risk reduction decision-making processes. "One of the easiest disaster risk reduction measures we can take is to empower children and youth and ensure they are actively involved in disaster risk reduction and contribute to making their cities and communities resilient to disasters. Denying them this right would be denying them from influencing their own future." The Sendai Framework aims to make sure that everyone is ready when hazards strike, so that responses are more effective and better organised. Children and youth are a critical part of that process. With that in mind, the Children in a Changing Climate coalition has developed this child-friendly guide which aims to make the Sendai Framework more accessible, especially to those aged 10 to 14. The coalition, which is made up of the ChildFund Alliance, Plan International, Save the Children, UNICEF and World Vision, developed the guide in consultation with children. Click here to read and download a copy. 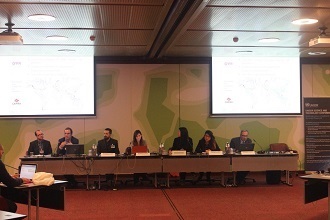 The Young Scientists Platform on Disaster Risk Reduction was launched on 28 January, 2016 at the UNISDR Science and Technology Conference during a side event on The Role of Youth in the Application of Science for DRR. Initiated by the UN Major Group for Children and Youth, the platform has been set up to provide a space for young experts from different scientific fields and regions to connect with their colleagues, to widen their knowledge, and to share their expertise. Young scientists can play a crucial role in strengthening the evidence-based implementation of the Sendai Framework for Disaster Risk Reduction. The platform will help to narrow the gap between disaster risk reduction-related science and policy. Furthermore, it aims to promote capacity building, through mentoring programmes, as well as providing opportunities for young experts to showcase their research and valuable contributions to reducing risk. The platform is designed to trigger international, interdisciplinary and inter-generational collaboration among young scientists, as well as with other institutions and experts working in the field of disaster risk reduction. A Young Scientists Roadmap has been drafted to complement the UNISDR Science and Technology Roadmap, in order to enhance the contribution of science towards policymaking and the implementation of the Sendai Framework. Apart from launching the platform, young scientists from different parts of the world were actively engaged in the lead up to and throughout the UNISDR Science and Technology Conference. They participated in various activities, including as session discussants, at side events, and at the poster exhibition of the conference. The next step is to finalise the Young Scientists Roadmap and start its implementation. Platform membership is open to any interested young scientists. The negotiations and consultations that led to the adoption of the Sendai Framework for Disaster Risk Reduction in March 2015 gave children and youth a host of opportunities to engage meaningfully in the process. This marked the start of the enhanced participation of children and youth in setting the global disaster risk reduction agenda, with thousands mobilising for coordinated peer-to-peer training and contributing to building a sustainable society for all. On 1-2 February 2016, representatives of youth groups, governments and high level political representatives met at UN headquarters in New York for the annual Economic and Social Council (ECOSOC) Youth Forum. The aim was to discuss youth engagement and priorities in the implementation of the 2030 Agenda on Sustainable Development. While recapping 2015 and determining the way forward, representatives from the UN Major Group for Children and Youth (UNMGCY) highlighted the importance of disaster risk reduction and the Sendai Framework. 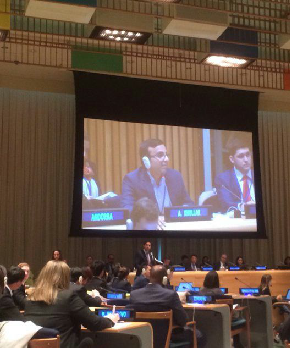 In the opening of the ECOSOC Youth Forum, UNMGCY organising partner Aashish Khullar shared successful elements of youth engagement on the Sendai Framework. During the session on health as a crosscutting theme, UNMGCY member Donovan Guttieres spotlighted the importance of a science policy interface for the better implementation of the Sendai Framework and spoke about actions at the UNISDR Science and Technology conference. Issues also addressed included the links between the Sendai Framework and the ongoing Habitat III process, notably the importance of resilient urbanisation. It is now widely recognised that the 2030 Agenda and all other international frameworks will have to include disaster risk reduction as a crosscutting priority area with sufficient resource allocation. Additionally, young people are eager to contribute to these processes through engagement in building the society we want during the coming 15 years and beyond. UNISDR works closely with SDG Coordinators to align the SDG indicators to those of the Sendai Framework. Both sets of indicators seek to ensure that no one in the world is left behind. Children and youth are actively involved in this process.Click here for more information on the work on indicators. As a follow-up to the global children and youth mobilization process on the occasion of global and regional platforms for disaster risk reduction, the highly successful Children and Youth Forum for Disaster Risk Reduction at the World Conference and their effective reach out to Governments, decision-makers and private sectors CEOs, children and youth’s capability to shape and design their future, to convey their views and opinions and to influence the decision-making process was duly recognized and acknowledged as part of the Sendai Framework on Disaster Risk Reduction. Children’s Charter on Disaster Risk Reduction – A Model for Children’s Engagement in Disaster Risk Reduction A major action plan for DRR by children for children building on an extensive consultation of 600 children around the world. Children and youth coordinated a major mobilization process to the Sendai Framework implementation that resulted in a powerful call as an outcome of the Children and Youth Forum for Disaster Risk Reduction. Commitments were also submitted directly to the World Conference as part of the Voluntary Commitments process to s podt-2015 framework for disaster risk reduction by selected youth movements. "We need to do business differently. We need to always involve young generations. Children and youth are said to be the leaders of tomorrow." Video prepared by children and Youth for the World Conference on Disaster Risk Reduction. We want to be heard! The unprecedented children and youth mobilization process in support of the Sendai Framework (consultations and negotiations process to Sendai, extensive use of social media, active involvement and contribution in Sendai, including through the Children and Youth Forum) has demonstrated children and youth’s capacity to take charge, organize themselves, think strategically and reach out to World Leaders on disaster risk reduction. Children and Youth consultations at Regional Platforms for Disaster Risk Reduction successfully recognized children and youth’s added value in reducing disaster risk and in building community resilience to disasters. Children and Young People in the Pacific "Step up for Disaster Risk Reduction!"